The next time you’re looking out your window, pay attention to the squirrels in your yard. It may be hard to see grey squirrels against tree trunks or shadows on the ground. However, the white squirrels stand out clearly. 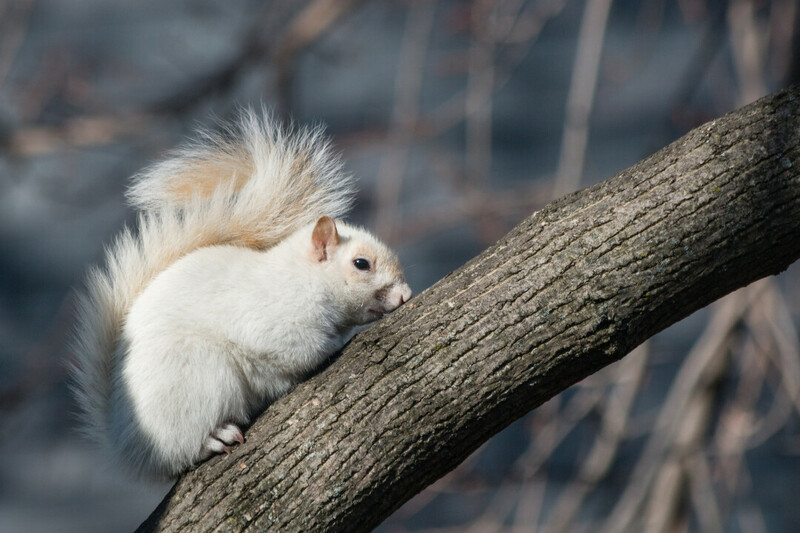 White squirrels are rare in other parts of North America. White and grey squirrels belong to the same species – Sciurus carolinensis, or Eastern grey squirrel – but they have some genetic differences that produce changes in colors. Some white squirrels are albinos, which means their bodies don’t produce a pigment called melanin. Their eyes are red or pink because they don’t have pigment to hide the color of the blood vessels underneath. Others white squirrels have leucism, which means they partially lose pigmentation in their fur, but not their dark eyes. White lions and tigers also have leucism. Regardless of the reason, the rare white squirrels thrive here, and that’s the true mystery. Remember how easily you saw that white squirrel in your yard? Predators spot them just as quickly. And yet every year we see more white squirrels in Eau Claire and other parts of the Valley. There’s no clear answer. It could be that because cities have few predators – such as hawks, owls, and foxes – white squirrels don’t have to worry about hiding. Another possibility is the gene that makes a squirrel white also gives it some other advantage that we don’t know about, like a better sense of smell or hearing. However, the most likely reason is … us! People like white squirrels because they’re so unusual, so we might unintentionally help them more than grey squirrels. We might be more patient with a white squirrel raiding our bird feeders. Or we might be faster to see a white squirrel crossing the road while we’re driving and hit the brakes sooner. Whatever the reason, white and grey squirrels are fun to watch in our yards, and they’re here to stay. Katie Venit is a professional freelance writer who enjoys writing about everything, but especially food and drink, culture, the Great Outdoors, and education. Preferably all in the same story. If you'd like to work with her, email her at katie.venit at gmail.com.